Currently many students are researching subjects related to the aims of the Trust. These include more than the hitherto standard repertoire of studies of war, e.g. battles, campaigns, weapons, military formations and generalship. They also include a wider field of studies: the personal experiences of the participants, the social history of armies, the military in the state and society, public order and aid to the civil power, and UN peace support operations. The establishment of an award scheme to encourage studies in those areas increases a student’s status, and their interest and participation in such schemes. In pursuance of this interest, the Trust will give an Award, ordinarily annually, of €350 to the student whose paper, read at the Irish History Students’ Association Annual Conference, is deemed outstanding by a panel of judges, and which, through new research, adds to our knowledge of the military heritage of Ireland. Papers are between 5,000 and 8,000 words long, inclusive of footnotes, and are assessed by a panel of judges. In assessing the papers the judges are cognisant of the worldwide nature of Irish military heritage and the range of military operations embraced by that term. It is not merely a record of individual or group activity, of the success and failure of military leadership in battlefields, campaigns and wars. It also includes service in peace support operations and in the maintenance of law and order in aid to the civil power duties. Furthermore the impact of such activities on the economic, political or social life of the communities of the participants may be relevant to the paper. Consequently submitted papers must concentrate on one or more of these aspects of our military heritage within this broad definition and, through their research and written presentation, expand our knowledge of the history of the Irish soldier. Charlie Trainor was a regular soldier and served with the 2nd Battalion The Royal Inniskilling Fusiliers during World War 2. On 3rd November 1943 during the Italian Campaign, when a sergeant, he led a successful fighting patrol as a result of which he was awarded the Military Medal. The citation reads: “Sgt Trainor’s dash, determination and personal bravery were undoubtedly responsible in a large measure for the way in which the patrol succeeded in achieving its object in the face of enemy fire” Trainor was later commissioned in the field and retired as a Major in 1961. He died in 2009 aged 89. The winner of the 2010 award is Mr Paul Maguire, a history student at St. Patrick’s College, Drumcondra in Dublin. His paper, The Fingal Battalion: A Blueprint for the Future ? 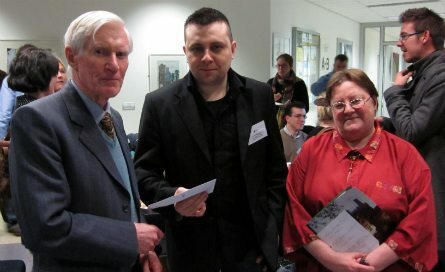 Our photograph shows Paul receiving his prize from the Chairman of the Trust, Major General (retd) Paddy Nowlan, in the company of Ms Deirdre McMahon, Secretary of the Irish History Students Association, at their Annual Conference at University College Cork in February 2011. Download his paper, The Fingal Battalion: A Blueprint for the Future?